Tour Kraft's Body Shop Repair Facility and meet our Quality Staff Members while learning obout where you can have your car repaired. Welcome to our Front Office. Once inside you will find a very comfortable and non-threatening atmosphere. 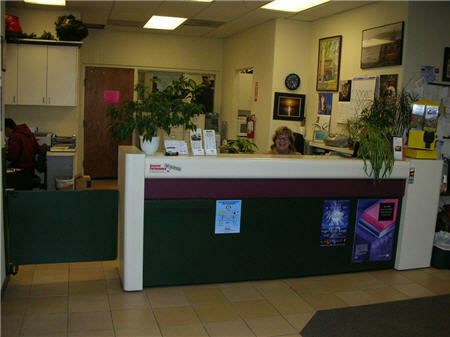 We tried to create a non-intimidating and professional environment for our customers. We have friendly, experienced staff that are here to help current and future customers resolve there collision related needs. We don't need to fix every car, but we do want every one that comes in to have a quality experience. Your problem becomes our problem. Consumers have many choices in today's market; however, it can be very scary to find a business you can trust. There are a lot of manipulation and scare tactics used by shops and insurance companies to capture you and your car. Kraft's Body Shop has built its family owned business for over 40 years on integrity. We want to earn our customer's loyalty for life. Parts Department- Did you know, that the average number of parts on some current model cars is over 10,000 items. The specificity requirements are now more important than ever. Collision related parts don't come from just any auto parts store down the road. They are uniquely made for each year, make, model, and color. Insurance companies force requirements for alternative parts to be used in collision repair. Kraft's Body Shop requires parts that we can stand behind and guarantee. The truth is, that we sometimes even have a repair delay because we reject replacement parts during the repair process. If it doesn't pass our standards or requirements, we will send it back. We would rather deal with a problem during the repair than the customer deal with it down the road. Body Department- It takes a lot of skill and knowledge to properly repair damages after an accident. Whether it is a small dent or major collision, Kraft's Body Shop has the expertise to make it right. Technicians utilize current technologies, skills and resources from ICAR, ASE, 3M, Original Equipment factory training, Mitchell, Chief, Wyoming Tech Schooling, and in-house journeyman experience passed down through generations. 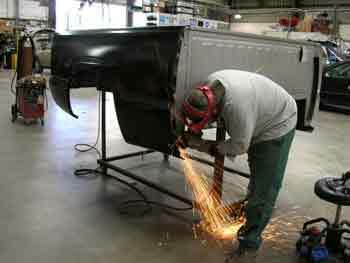 Kraft's Body Shop utilizes Mig and Resistance welding equipment. We have modern equipment and materials that allow us to rebuild(as close as possible in today's market) vehicles back to factory specs. Repairs should be done correctly so the structural integrity is not compromised. Safety, fit, and function are a necessary end result when repairing a vehicle's damage. Our goal is to have a repair that looks and behaves no differently than it did before the damage occurred. Frame Department - When a vehicle is damaged in an accident, the extent of the damage is not always visible. The structural integrity may be compromised in many ways. Today's vehicles are built to tolerances that are measured in millimeters. Damage can affect many conditions including some of the following: airbag deployment timing, handling characteristics, panel gaps and fit issues, suspension and wheel alignment and last but not least safety. The need to accurately decipher structural damage is often overlooked. Often damage is only measured in length or 2 dimensional measuring. Kraft's Body Shop has invested a lot of resources so that frame and structural damages can be identified. Current technologies allow us to measure and identify damages through use of lasers and computers. A 3-dimensional measuring capability is vital to evaluating the extent of damages. Paint Department- Consumers have more car color choices than ever before in our history. Options stretch from the traditional single-tone, two-stage, and three-stage (tri-coat) colors. Within the many colors there are differing micas, pearls, and color flops. Unknown to many people is the fact that a lot of colors are very translucent giving a multitude of color flops even on the same car. Kraft's Body Shop utilizes state of the art color technologies from PPG. PPG uses current color data bases as well as a color analysis tool called, "Profit". This tool takes an image of the vehicle's paint color and identifies the closest match within the international color library. Color matching requires a lot of technician skill to determine how to best match and apply the complex colors on today's cars. Our facility has two environmentally controlled and heated downdraft paint booths. We back our paint work and materials with a Lifetime Warranty for as long as you own your vehicle. Disassembly and Repair Planning Department- Most jobs go through some version of disassembly for damage evaluation. Kraft's Body Shop has an advanced version of Disassembly and Repair Planning. This is a newer and developing department based on Lean Six Sigma Principles. The effects of jobs going through this repair process are to increase throughput capabilities and to promote estimate accuracy at the beginning of the repairs. This helps us achieve a more accurate repair process while improving repair quality and decreasing cycle time. Thus, getting the customer back in their correctly repaired vehicle faster. Detail Department- The finishing touch happens once repairs are completed and the car goes through the final detail department. Each job is cleaned to remove any paint masking or dust from the repair process. Once the car is cleaned it gets a final quality control check to review all work that was to be done. The car is cleaned so the completed repairs can be admired by the customer. File Handling and Billing Department- The amount of work done in this department is often not realized by consumers. Claims processes have become very convoluted. In order to get paid by insurance companies, to keep up with BAR requirements, and to keep customer billing accurate there is a lot of work done behind the scenes. Computer technology has advanced the amount of information utilized during a repair process. There is so much information to keep track of it is easy to have "Data overload". Much of the difficulty comes from Insurance company requirements. Each insurance company in todays market has different standards. The collision industry currently suffers from much increased overhead costs associated with managing claims differently for each insurance company. 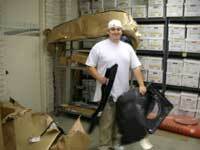 Kraft's Body Shop has well trained staff with many, many years of experience dealing with all insurance work. Kraft's Body Shop will handle most all of the claims negotiations, claims adjuster scheduling, supplements, parts price increases, sublet work, insurance adjuster communications, warranties, insurance parts usage requirements, insurance betterment requirements, photo documentation, itemized billing, estimate linguistics, uploading claim files, tracking job cycle time, rental car updates, insurance special forms, job log notes, insurance compliance requirements, customers itemized "Final Bill" statements and bill collection. KBS Goal- While Kraft's Body Shop can't prevent the accident from happening, we are in business to repair your vehicle, as close as possible, to pre-accident condition. 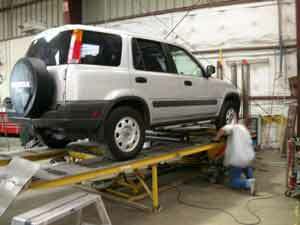 We not only want to restore your car to pre-accident condition but restore your confidence as well. We take pride in resolving your vehicles damages and gaining a customer for life.